The occasion brought young Russian conductor Stanislav Kochanovsky to London for the first time. He has been making waves around Europe and beyond, and we now heard just why. A proper baton, held delicately between thumb and index finger so that expressive movements as well as a clear beat become possible. And a continuous beat at that. Kochanovsky often had his finger to his lips, such that some notes at phrase ends were on the threshold of audibility, which added tension (for player as well as audience) [...] The finale’s blazing coda was Brucknerian in nobility, and this impressive conductor was duly acclaimed. If this was an audition for the Principal Conductorship which Salonen will soon vacate, then Stanislav Kochanovsky might have become a contender. Whether in that position or not, he must be summoned back. Kochanovsky is a superb accompanist, with Matsuev all the way, while allowing his orchestra to take centre-stage as appropriate […] the quicksilver reactions of Kochanovsky and his orchestra were remarkable. There is no doubting the musical intelligence of this conductor. The Philharmonia responded to Kochanovsky with some of their finest playing […] one has to acknowledge the strength and consistency of Kochanovsky’s vision of Shostakovich. Conductor Stanislav Kochanovsky led the musicians beautifully through these dances; exotic tones sifted through a Russian filter, double removed today and therefore extra dreamy. […] Stanislav Kochanovsky always leads the trusting musicians through the music; the many variations on a theme showed the romantic rises in nuance and pace. Sous la direction passionnée de Stanislav Kochanovsky, l'orchestre exploite la plus extrême dynamique. Du pianissimo le plus ténu jusqu'aux fortissimi explosifs, les sonorités instrumentales conservent leurs richesses de timbre. Stanislav Kochanovsky propose une spectaculaire épopée narrative où, jouant avec la dynamique non moins spectaculaire de l’Orchestre National du Capitole de Toulouse, cuivres et percussions triomphants, il anime de somptueux tableaux cinématographiques où on ne peut qu’être subjugué par la débauche d’effets sonores et par la vision d’images vivantes. Kochanovsky has a very good understanding with the orchestra: his gesture is elegant, beautiful and very refined, which almost seems to sculpt the sound. The enchanted fairy surprise with which Tchaikovsky chose to start the Allegro tranquillo, which opens us to a world of dreams, is delicately delineated by Kochanovsky, which shows a taste for the beautiful sound, the chisel, the perfectionism that reminds us Karajan’s spasmodic love of Tchaikovsky sound’s aesthetics. No one packs a heart-stopping tune into an oceanic orchestral swell quite like Sergei Rachmaninov, and this night of deep Romanticism belonged to his Symphony No 2. [...] From the pulsating Wagnerian brass of the Largo first movement through the transcendental conclusion of the Adagio and into the toe-tapping Allegro vivace Finale, it was paced beautifully with utter assurance by Kochanovsky. Principal cellist David Berlin seemed in danger of bursting on several occasions as Kochanovsky drew every ounce of energy from his section, imploring and cranking the strings into emotional overdrive. It was a sensational performance from orchestra and conductor alike, and received with thunderous applause from a most appreciative Melbourne audience. Stanislav Kochanovsky dagegen begreift ihn. Er steht im Orchestergraben vor der Philharmonia Zürich und erntet nach der Premierenpause einen Begrüssungsapplaus, wie man ihn selten hört. Und ja, er hat ihn verdient: für den intimen Tonfall, mit dem er das Stück beginnt. Für die Bläserfarben in der Briefszene. Für die Präzision, die nie plakative Gestaltung der Atmosphären, den sprechenden Gestus, mit dem er auch dann die Spannung aufrechterhält, wenn auf der Bühne fast nichts passiert. Finally, under the dynamic young Stanislav Kochanovsky, the orchestra also gave an exciting performance, even in a score whose harmonies and repetitions are somewhat predictable, and sometimes sound kitschy to the modern audience. Not so here, albeit the sublime solo oboe, flute, clarinet and horn passing a single lyrical line among them was enough to bring out a handkerchief. Stanislav Kochanovsky‘s conducting was more refined than dramatic but overall very valuable. The orchestration of this opera is really interesting and the young Russian conductor was very attentive to every nuance, colour and mixture of timbre, extolling from the score all its post-romantic athmosphere. 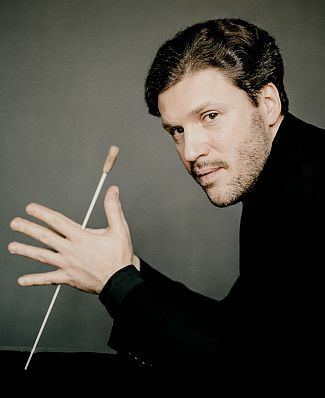 The soft melodies are always supported with finesse and orchestral transparency by the conductor who follows well the singers, globally his conducting seems the most interesting thing of this florentine performance. Quanto all’orchestra, segnaliamo il maiuscolo contributo dei professori dell’Opera di Firenze, guidati dalla sapiente concertazione di Stanislav Kochanovky che si fa notare per il piglio energico e incisivo. Il direttore trae dalla partitura effetti musicali notevoli e una variegatissima gamma di colori e spunti espressivi. La narrazione musicale fluisce compatta e scorrevole e crea quell’atmosfera da fiaba musicale, dove l’inquietudine, la malinconia, la tragicità, assumono toni colloquiali di sicuro impatto. Stanislav Kochanovsky gave a reading that fortunately has gone hand in hand with the “dark” concept of the story, from an ominous prelude, eerie, creepy, in which the winds are the only protagonists of the song […]; He brought out all the anguish and the guilt of King René in the dramatic Andante in C minor, as well as the magical exoticism and mystery that imbues the orchestra in the next monologue of Ebn-Hakia. He faced the most decorative moments discreetly, and made clever use of the “rubati” in the “arioso” of Iolanta giving it a poignant and mysterious charm. Excellent yield of the great duet between soprano and tenor, melodic climax of the opera, in which the emphasis on the triplet rhythm, highlights the amorous enthusiasm of Vaudémont. The young conductor Stanislav Kochanovsky offered a passionate and careful reading, with a calibrated dosing of effects and defining the various atmospheres that emerge from the score, from the almost pre-Raphaelite incipit to the beautiful and iridescent final. The greatest revelation of the evening was the guest conductor, young Russian Stanislav Kochanovsky [...] he conducted with musicality, technical proficiency, clarity and much musicality, achieving the best both from the music and from the orchestra itself. […] Kochanovsky navigated the orchestra faultlessly through the rhythmically complex score, enabling the orchestra to play with complete precision. Within the various sections of the orchestra the musicians played with a great variety of tone, from the raspiness of the brass to the tenderness of the strings. […] Kochanovsky did not allow the orchestra to wallow unnecessarily, but allowed the music to speak for itself. Il giovane direttore russo ha avuto agio di imporsi definitivamente all'apprezzamento del pubblico, con una trascinante esecuzione della Sinfonia n.2 di Borodin. L'opera usualmente viene citata con la definizione di "epica", il che chiarisce il vero spirito della fascinosa pagina. E il giovane direttore russo ha chiaramente mostrato di saper cogliere perfettamente il vero spirito della possente creazione. Nulla di «folcloristico» quindi nella sua visione, ma una decisa intenzione attuata in maniera esemplare - di riandare alla fascinosa originalità avvincente dell'opera, "popolare" al, ma nel senso più nobile della definizione e quindi ricca di spunti brillanti, esuberanti, coloriti che Kochanovsky ha valorizzato in pieno, trascinando la straordinaria compagine orchestrale del teatro verso orizzonti espressivi di grande incisività. Successo calorosissimo. Under the sovereign guidance of Stanislav Kochanovsky with elegant and demanding conducting the audience of the third Meisterkonzert of the season was taken to a wide Russian landscape with a folklore echo thanks to a strikingly gripping performance of the Moscow guests. A whole load of Russian culture experienced the audience of the second Meisterkonzert of the season at Eurogress Aachen. For the beginning four scenes from Glazunov ballet “Raymonda” were played. Music was in the best hands – of Kochanovsky and his musicians that maintained a round and absolutely balanced sound. Performing rarely played in the concert hall Tchaikovsky’s Symphony №1 with the programmatic title “Winter Dreams” conductor proved that he is not only the most elegant appearance at the podium, but also a brilliant sound organizer. In Kochanovsky’s interpretation the symphony sounds as a well-conceived whole, tempi flow, transitions work organically, brass is carefully integrated into the overall sound and never sounds itself noisy in the problematic Finale. It was an interpretive masterpiece. Russians made a proper explosion with both encores from Tchaikovsky’s operas. At the end the audience gave a standing ovation. I'm sure that Sheherazade is a test-piece for young conductors in Russia. Well it is a test which Kochanovsky passes with flying colours. His gestures were elegant and clear. […] The seascape of the finale was a pictorial riot of sound such as is rarely heard, especially at its climax with three hardworking percussion players' triangle, cymbals and bass drum. Kochanovsky was not just vital in his communication with the orchestra. Every soul in the audience was with him on this adventure. It is already obvious that this young man is a phenomenon. He is uniquely sophisticated in his sense of music and style. The works of Mussorgsky, Rachmaninov and Tchaikovsky he conducts with inspiration and youthful drive, enjoying pathetic moments, causing the orchestra to express emotions of ecstatic power (managing to avoid hysterical tear). Easily and elegantly he took the musicians away from heroic swing to delicate and tender pianissimo so that the orchestra of 120 instruments sounds like a warm sensuous whisper. In November took place the first Russian concert tour of the Kislovodsk Orchestra with its new principal conductor. Under the baton of Stanislav Kochanovsky the Orchestra proved itself to be a firm, well-organized, balanced team, and has shown perfect ensemble, with beautiful soft sound and particularly inspiration, which has been transmitted to the public. For the short time conductor succeeded to approach practically an ideal contact with the Orchestra and the musicians reacted on each maestro’s gesture and even smile with readiness and willingness. A young talented conductor, a short time ago having headed the Philharmonic orchestra, has managed to achieve not only a balanced sound, but interpretation that corresponds to the space stylistics of the Kursal theatre, namely the combination of the chamber refinement of phrasing and nuances that were worked up; along with ability to build up a grand form out of the musical piece. Kochanovsky avoided catchy but trivial contrasts, the sounding of his orchestra in dynamical respect was rather regularly over the whole act, without losing the expressiveness. The ability to underline the correlation between harmonious composition of the whole and vivid details communicated grandness to the interpretation. London Debut with Mikhailovsky Theatre in Coliseum with Giselle. “Wide, full conducting, effective, sensitive. Good appearance, a joyful, calm and smiling musician. Certain of what he is doing. He proved he is able to work, he showed the results of his work, being unconstrained and cheerful towards all”.